A sweet banana-like crop that is better eaten cooked. Sometimes called the "cooking banana," plantains can be fried, boiled, baked or steamed and used to make both savory and sweet dishes. A large "cooking banana" that is flatter and longer than the common Cavendish banana. With a firm texture, the flesh of this banana contains less sugar but more starch than other varieties. Roughly 7 to 9 inches long and 1.5 inches wide. Choosing: Choose by color depending on what dish you are preparing. If purchased green and you want to use them brown/black they will take up to 2 weeks to ripen on the counter. Buying: Almost all grocery stores will carry them fresh in the produce section. Goya and other manufacturers offer pre-sliced, fried sweet plantains in the freezer section. All Latin grocery stores will carry them in their produce section. Procuring: These are a tropical fruit and grow best closer to the equator. Plantains serve different culinary purposes in during their stages of ripeness. Green plantains are hard and are often peeled and then sliced thin and fried into chips or cut into 1 inch thick pieces, fried, then flattened and fried again into tostones. The green plantain can also be used as a thickener in stews. Just-ripe (yellow with black spots) are often baked, streamed or mashed, and very-ripe (black to yellow-black) are sauteed or fried. 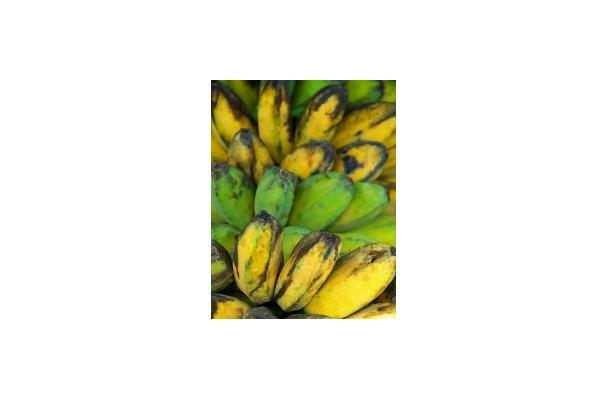 The starchy green bananas are cut into 1 inch sections, peeled, fried, smashed down, and then refried until crispy. These are called ‘Tostones’ and are usually sprinkled with salt and sometimes a spritz of lime juice. ‘Maduros’ are made from ripe slightly yellow/brown to black plantains, often cut into slices on the bias, then fried in a mixture of olive oil and butter until dark, soft, and sweet. Cleaning: Most likely, no need to clean. Peel and discard peeling. Storing plantains in the refrigerator will slow the ripening process, but may darken the skin. History: Fried plantains are popular in Cuban restaurants, where they are served with such delights as Lechon Asado (garlic-spiked roast pork) and “Moros y Cristianos” (black beans cooked with white rice).